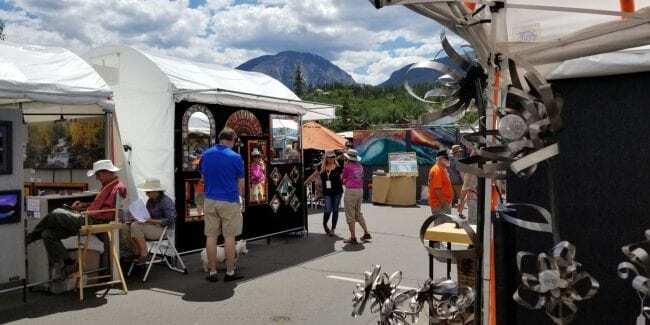 [Silverthorne Fine Art Festival vendors. Photo: mountainartfestivals.com] Back for the second year in a row, this event once again invites all Colorado art lovers out to Summit County. The 2nd Silverthorne Fine Art Festival is a free, family event held at the base of the gorgeous Gore Range. This year’s event runs from Thursday to Saturday, July 12th to 14, 2019 at Silverthorne Recreation Center’s overflow parking area in the heart of town. The hours on Friday and Saturday are 10am to 6pm, and 10am to 5pm on Sunday. More than 80 magnificent artists from all over the United States will display and sell their work. Each artists will be available all weekend to talk shop and explain how they craft their works of art. There will be 13 fine art categories including jewelry, painting, sculpture and ceramics, among others. Food, beverage and live music will be provided Friday through Sunday.